Gilda Radner was the first person hired for the original cast of what was then just called NBC’s Saturday Night. She was one of the funniest people to ever live, on-screen and off. And her life was tragically cut short by ovarian cancer at age 42. The new documentary LOVE, GILDA has deep affection for its subject, but it tells us nothing new that fans don’t already know, and there’s nothing surprising about its format either. This is an extremely basic doc for a person who was larger than life. Born in 1946 in Detroit, Gilda enjoyed an upper-middle class lifestyle. She struggled with eating disorders almost her entire life, but found release through performing, especially after the death of her father at age 12. Her star was on the rise thanks to the Toronto production of Godspell (which included almost every funny person in Canada) and the National Lampoon Radio Hour, which helped get her into the original cast of SATURDAY NIGHT LIVE at age 29. By this point, SNL, especially its first five seasons, has been so mythologized that any further discussion of how revolutionary it was feels a little tiring at this point. Thankfully the film focuses more on the camaraderie of that core cast, and on the creation of Radner’s iconic characters Emily Litella and Roseanne Rosannadanna. Despite rapturous acclaim for her one-woman Broadway show, Radner’s post-SNL career never flourished. Almost every movie project she took (many co-starring her husband Gene Wilder) flopped. But she found happiness with her true love, even as some of her personal demons were never fully beaten. 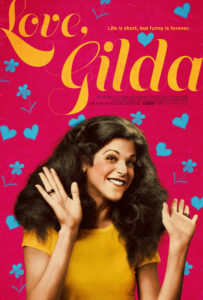 Gilda Radner was a gifted performer, a once-in-a-generation talent who could do it all. While LOVE, GILDA believes this to its core, it’s never more than a standard-issue biographical documentary. While it’s no insult to her memory, a talent such as Gilda’s deserves a little bit more. LOVE, GILDA opens Friday in limited release.